Your own private 2.6 Acre Oasis Awaits you. 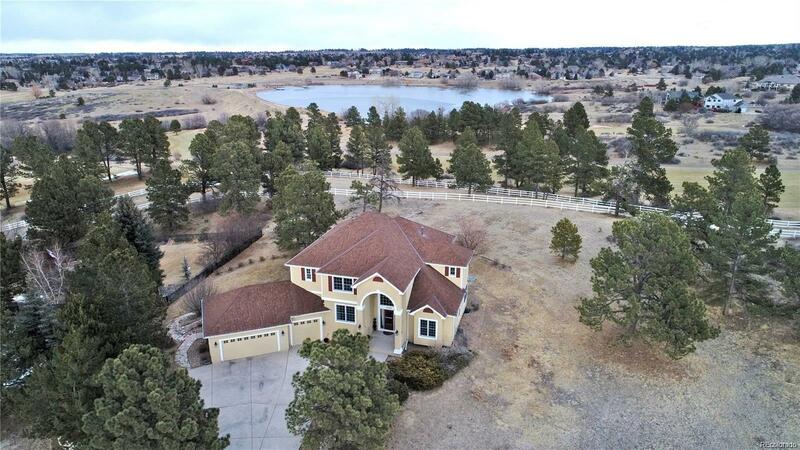 Incredible mountain & Lake views, no neighbor behind you, back to open space, lots of wildlife all within 7 miles of Downtown Parker. Brand New kitchen overlooking huge family w/Mountain Views, fireplace. Head out the massive deck overlooking open space. Hardwd flrs on main level. Formal living & dining rms. Vaulted grand entry way. Main floor study. 3/4 bath on main level. Large laundry rm mud rm combo. Private large master suite with its own deck & incredible views. fully updated master bathrm w/large walkin shower, huge master walkin closet. 3 great secondary bedrms &2 full bathrms on upper level. The basement is your mountain retreat, with hand Hewn log beams & rails, ready for you to complete the vision. Two bedrooms, 3/4 bathrm, steam rm, kitchen area overlooking large rec rm with fireplace and built in entertainment center, tons of windows, W/O to private covered patio area. Mother in law basement. 3 Car attached garage.